A great tool to attract new Rewardical members! Our Rewardical X-Cards are designed to promote Rewardical--our powerful loyalty program for businesses--and digital Rewardical Reward Tokens. Hand these cards to anyone and everyone you like--there is almost certainly something they will be interested in using their tokens toward, including gift cards, Bitcoin, Silver Bullion, and more! These business-card-sized X-Cards sport a glossy, full-color front-side and are printed on heavy card stock. 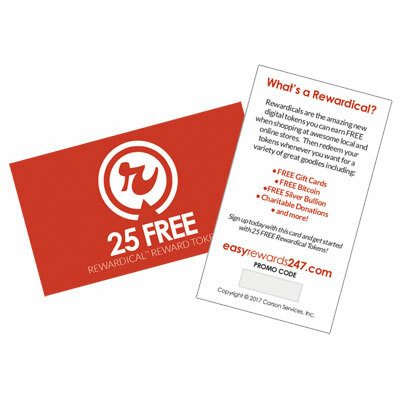 Side one of the card features an attractive, eye-catching design with the Rewardical logo and text referencing the "25 FREE Rewardical Reward Tokens" the card can be redeemed for. Side two features the following ad text: ------------------------- What's a Rewardical? Rewardicals are the amazing new digital tokens you can earn FREE when shopping at awsome local and online stores. Then redeem your tokens whenever you want for a variety of great goodies including: * Free Gift Cards * Free Bitcoin * Free Silver Buillion * Charitable Donations * and more! Sign up today with this card and get started with 25 FREE Rewardical Tokens! easyrewards247.com ------------------------- How to use your Rewardical X-Cards: Just print or stamp* your promo code number (which you can get by clicking the refer a friend link at Rewardical.com) in the Promo Code gray box located on side two. Then distribute your cards to your friends, family, anyone you think who would like to get free stuff! Recipients of your cards will go to the current Rewardical referrals landing page (easyrewards247.com), where they will be asked to enter the promo code. They will then gain access to the Rewardicals.com site where they can sign up for their free Rewardical membership (with you as their referrer) and grab their 25 free tokens. You will receive an e-mail notification each time one of your cards generates a new member sign-up. And as their referrer, you’ll now be set to earn unlimited 10-1 Rewardicals on every Rewardical they earn...for life! *You can purchase a self-inking rubber stamp, customized with your SFI ID, from VistaPrint for as low as $12.99 here. A great tool to attract new Rewardical members! Our Rewardical X-Cards are designed to promote Rewardical--our powerful loyalty program for businesses--and digital Rewardical Reward Tokens. Hand these cards to anyone and everyone you like--there is almost certainly something they will be interested in using their tokens toward, including gift cards, Bitcoin, Silver Bullion, and more! Sign up today with this card and get started with 25 FREE Rewardical Tokens! Just print or stamp* your promo code number (which you can get by clicking the refer a friend link at Rewardical.com) in the Promo Code gray box located on side two. Then distribute your cards to your friends, family, anyone you think who would like to get free stuff! Recipients of your cards will go to the current Rewardical referrals landing page (easyrewards247.com), where they will be asked to enter the promo code. They will then gain access to the Rewardicals.com site where they can sign up for their free Rewardical membership (with you as their referrer) and grab their 25 free tokens. You will receive an e-mail notification each time one of your cards generates a new member sign-up. And as their referrer, you’ll now be set to earn unlimited 10-1 Rewardicals on every Rewardical they earn...for life! *You can purchase a self-inking rubber stamp, customized with your SFI ID, from VistaPrint for as low as $12.99 here.